A successful, dynamic and good looking cricketer naturally becomes a youth icon and if he’s a compassionate animal lover too, we will take no time to sniff him out. Meet Virat Kohli, who’s known for his immense courage and firehouse passion. His personality transcends through to his game which is level headed yet attacking. And when he’s not running for runs…he loves to run around with Bruno, his pet pooch. 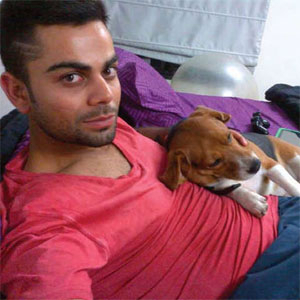 Read on to know more about Virat’s doggy delights. With a penchant for rising to the occasion and meeting expectations, Virat Kohli never appears to buckle under pressure and it is this trait, amongst many others, that allowed him to lead the Under-19 Cricket World Cup 2008 team all the way to victory…and since then there’s no looking back. He’s one of the leading team members of the Indian cricket team. Besides cricket, the other thing that he has enjoyed since childhood is pet companionship. Here’s more on his pooch love. According to Virat, they are the most loyal and loving companions that a person can have and he makes sure to spend quality time with them. On asking how he spends time with his furry angel, he replied, “I take him out for walks and runs whenever I can. I love spoiling him with treats occasionally. And I also take him out on weekend trips. Once, we took our pet with us up on a drive to Mussoorie, and he loved the wind on his face! Qualities you love in your pooch: Very loving and friendly. Funny/crazy antics: Chasing his tail! Special treat: A drive with the windows rolled half-way down, so he can feel the breeze.